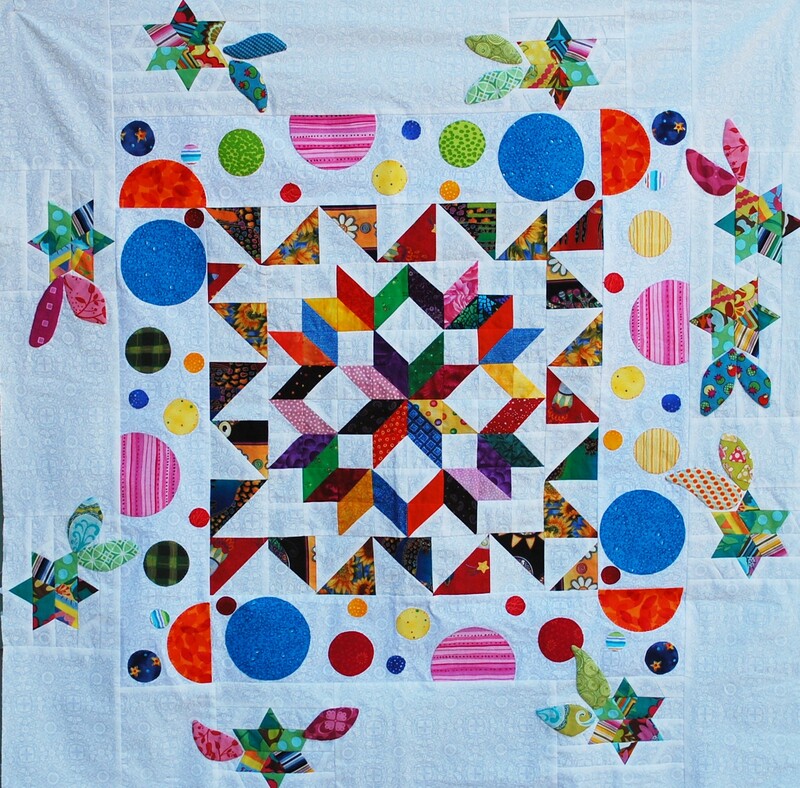 Here is a Round Robin I did with some of the guys from QuiltGuy….I dit the last round with the pseudo-star-flower sorta look. Detail below. I had the applique round, and I am not particularly fond of applique. 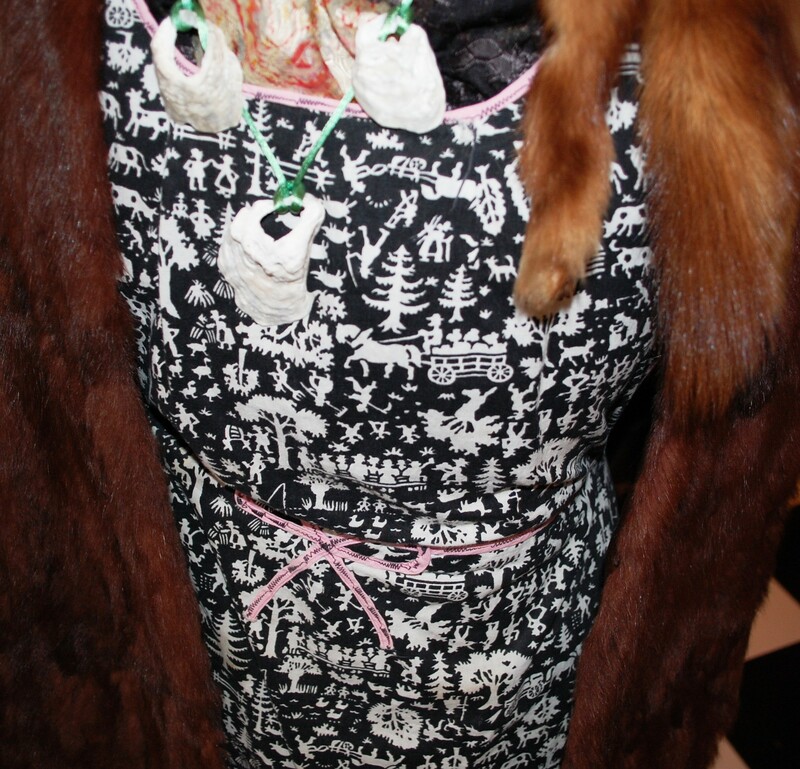 Actually I love OTHER peoples applique, just not mine. I don’t have the paitence I think. 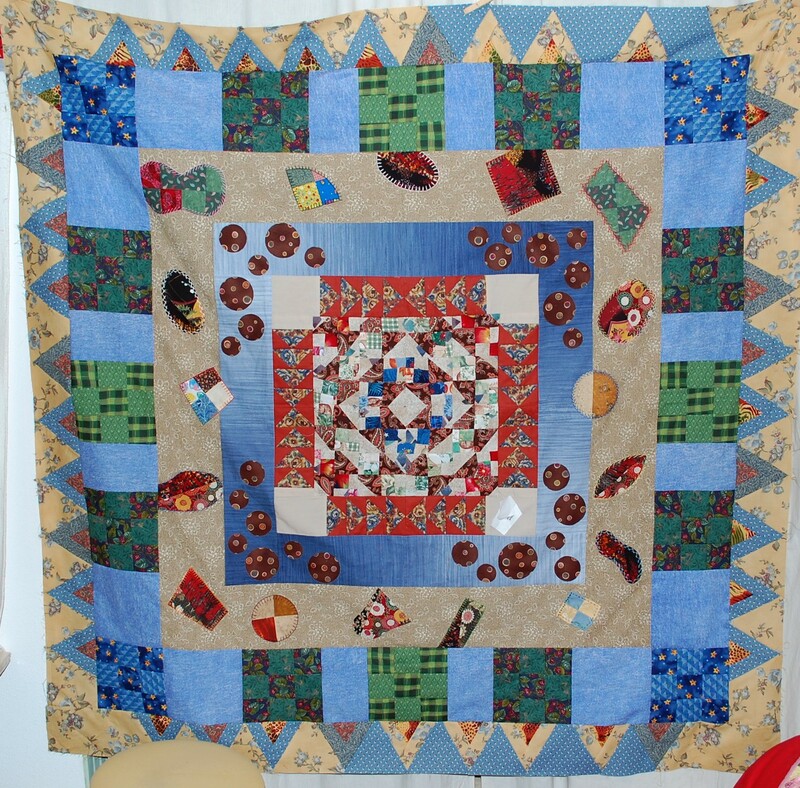 This is another Round Robin from the QuiltGuy group. Again, since I was the last one in possession of the quilt at this time, I did the round of 60degree triangles around the blue-9-patch border. 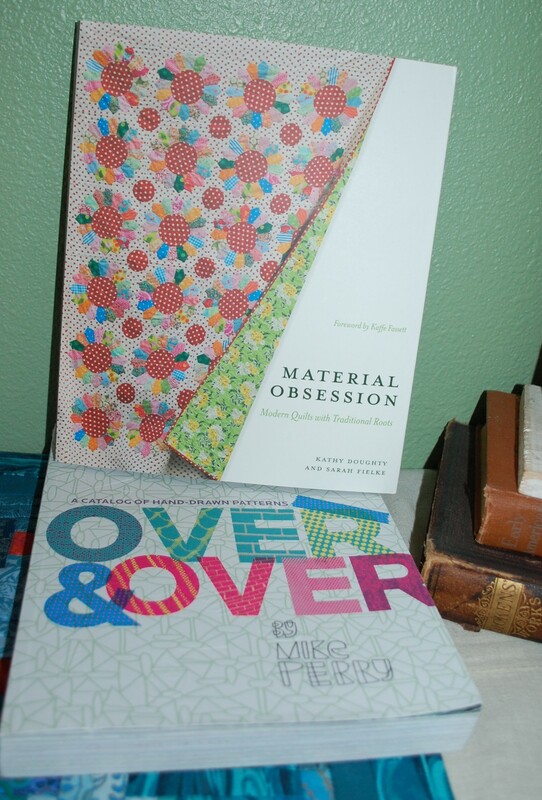 Two great books that Linda got me for my birthday and/or Valentine’s day. I can’t remember which now. Both are TERRIFIC books! 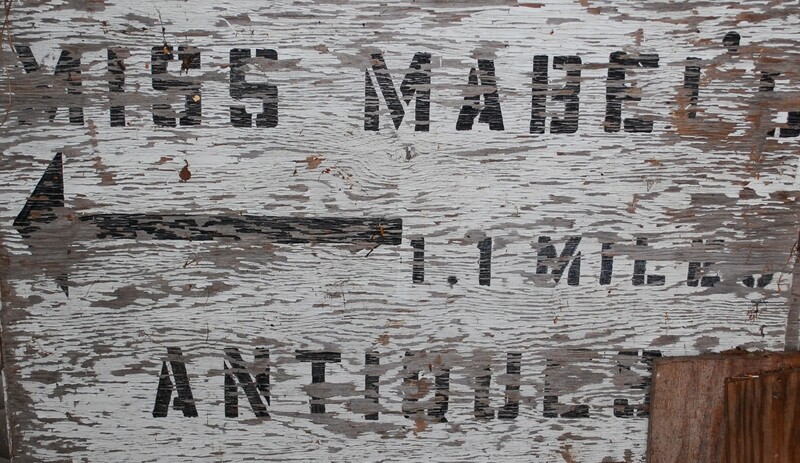 Our old directive board from when we ran a vintage clothing/antique smalls shop on our property. I love the worn look of this….I have very fond memories of the days we kept that shop going…..
New ironing surface reinvention….before this area was a simple fold up ironing board—ricktey, no storage underneath, and it was noisy when I would iron late at night, and this room is right over our bedroom, so it would sometimes keep Linda awake. Different angle. I love Anna Maria’s stacked books covering the ironing surface. The wooden section actually needs to be taken out and painted white/grey/pale green/ or blue ( I haven’t decided yet) so nothing is totally secured yet. The little cubby holes underneath served two purposes. It got the ironing surface higher and more comfortable for me to iron, and it adds storage capability…I am delighted with it. I have an extra cutting mat in there, and if I need to trim something at the pressing time, I can just whip it out and get it trimmed right there. 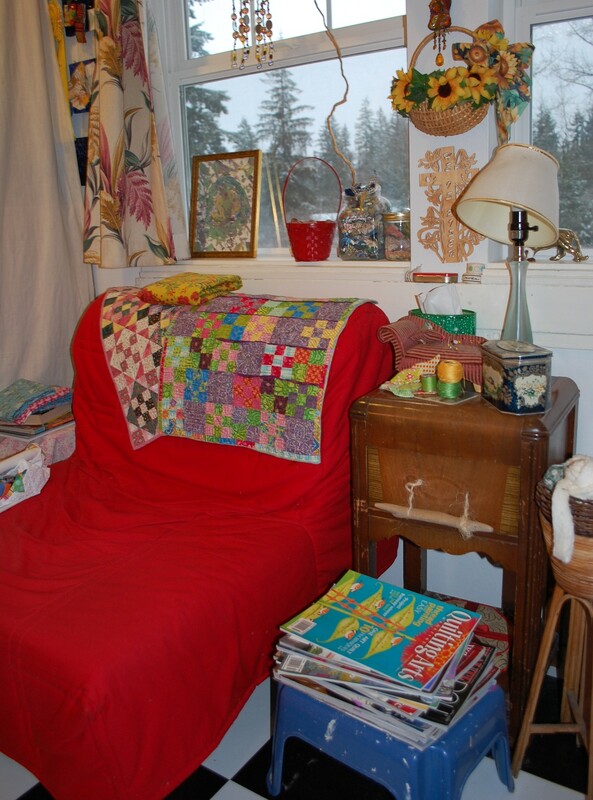 This area of the studio used to just store boxes and well….junk…now Linda has a nice place to sit on the IKEA futon and if we ever need a space for someone to sleep, it would be tight, but we could rearrange it and get a space made. I like to sit here too sometimes. 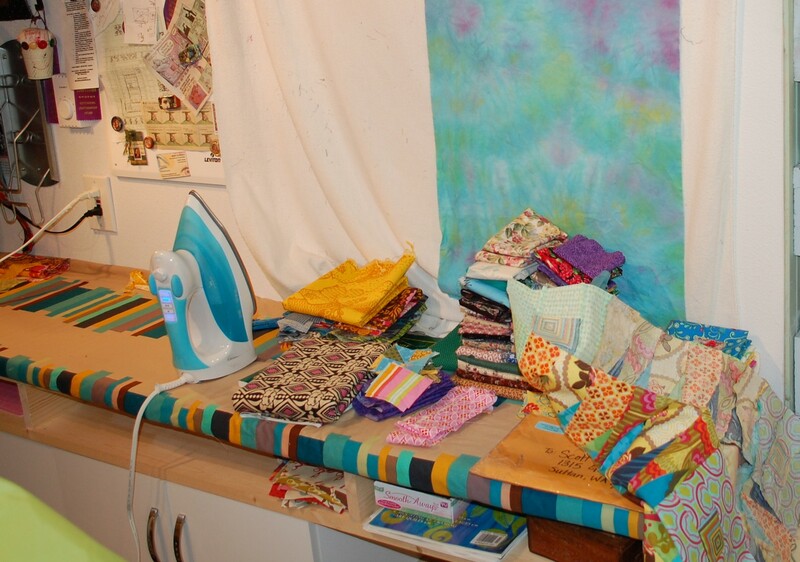 It is a great place to hide from the kids as it is behind the quilting machine and frame, and you can’t see this area from the main area of the studio too well. 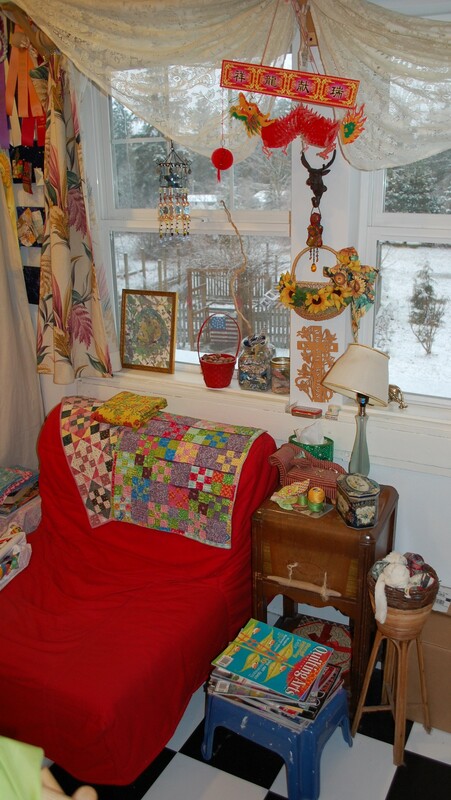 Another view…notice this was taken on a snow day! Here we sneak over to Linda’s side of the studio to see this old apron on the dressmaker’s dummy…I am sure she should have a name, but I don’t think she does. Just stylish accessories. 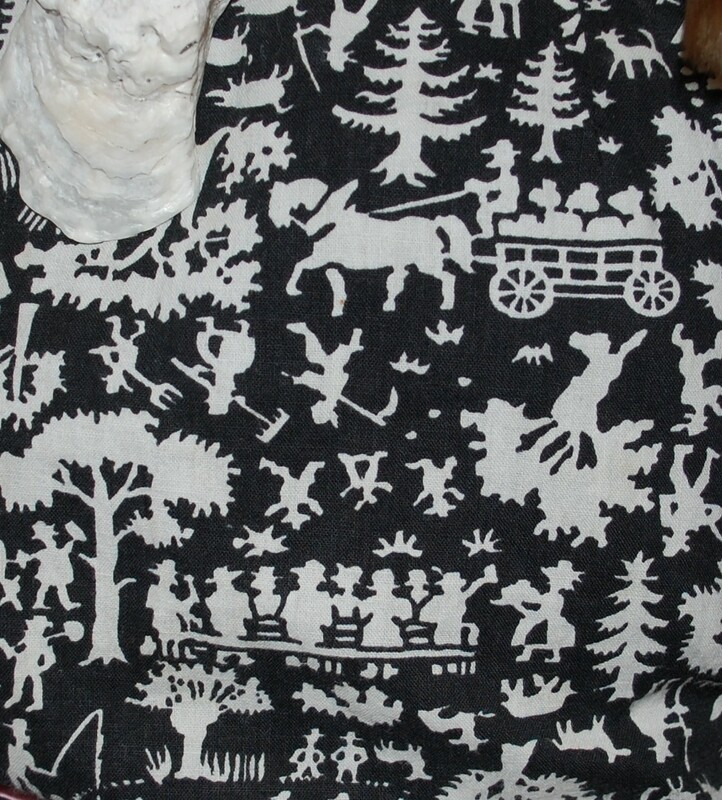 I just LOVE this vintage fabric. So many things going on! So that is phase one of the Blue Nickel Studio PC Desktop Clean Up (BNSPCDCU for short)…. Loved the tour! 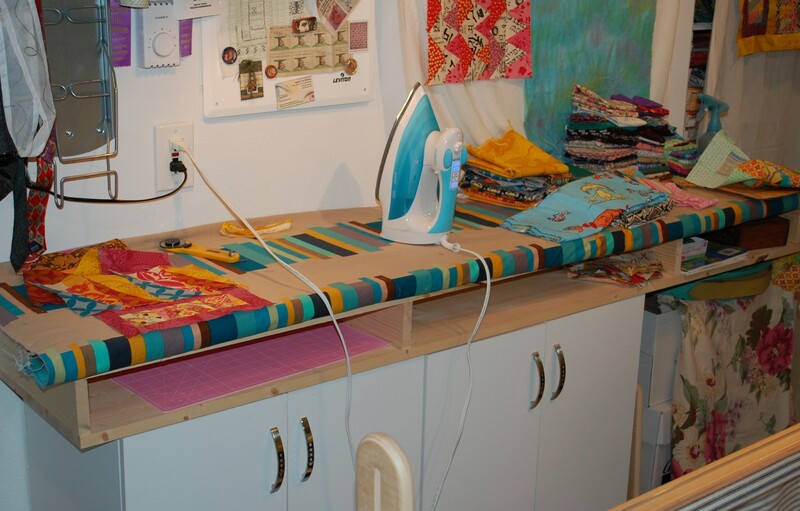 The ironing station is ingenious. Wow, both of those Round Robins are great! I didn’t see either one of them. The mostly white one is soooo Peter Max. You’re color palette is outside of my range, but I love it. I could only hope to use color the way you do. It’s one of the reasons you’re on my daily blog checklist. What’s Mark upto? what’s Scott doing? DUDE, that is such a compliment! Thank you so much!